The woozy, weird atmosphere turns romantic here as Emily Watson’s inexplicably tolerant Brit and Adam Sandler’s unstable loser meet in Hawaii to the tune of Shelley Duvall’s whispy, off-kilter warble, gorgeously reappropriated from Popeye. There are some lovely, gently surreal touches – Barry collapses onto his stolen harmonium, stroking the keys in despair, and the song swells up from nowhere. Lena answers her hotel telephone, and the lights of downtown Honolulu suddenly flicker on. 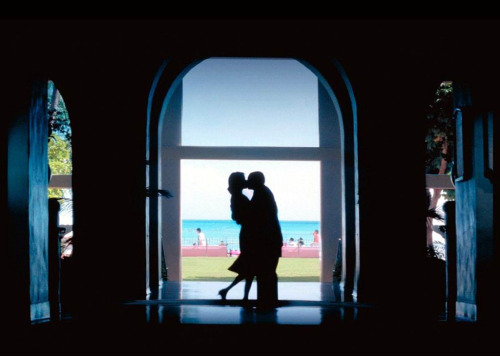 The song plays out fully for an almost torturous six minutes through Barry’s headlong flight from his bleak office, through phone-related setbacks and doubts followed by giddy excitement (even the camera breaks into a run), culminating in a dreamlike, beautifully unlikely reunion in a hotel corridor, silhouetted against the perfect Hawaiian beach. Against all odds (and considerable oddness) here love somehow conquers all.